Salvation Army staff in the Matanuska-Susitna Borough got a big surprise while counting change from their red kettles Friday. You know the ones, staffed by bell ringers seeking donations at store entrances. An anonymous donor dropped a gold coin, which the Salvation Army says is worth $1,251, into the kettle at the Three Bears store on Knik-Goose Bay Road in Knik. “This is so unusual, we were just thrilled,” said Janet Kincaid, who chairs the Mat-Su Salvation Army board and serves on the Anchorage Salvation Army Board. 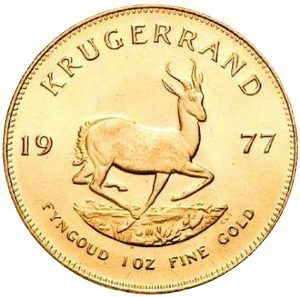 Kincaid realized the coin was special — it’s a gold Krugerrand from South Africa — as they were counting out lower-denomination change. Gold coins show up in the Salvation Army’s kettles every year, usually anonymously and in other parts of the country. This is the first Krugerrand believed to have been dropped into one of the red buckets in Alaska. Kincaid said she thought the earthquake might’ve had something to do with the donation, because the area where it was given was hit hard. The quake shut down the Three Bears store for a couple of days, she said. The gold Kruggerand was likely not the result of someone cleaning out their pockets, or an accident, she said. That’s because it was in a plastic sleeve and came with a note in memory of someone. Kincaid said she doesn’t want to reveal the name, because it was given anonymously, and she doesn’t know if the person wants their loved one’s name made public.